In our very first installment of Living The Dream – We take a look at Jordan Pacheco of the Colorado Rockies. On September 6th, 2011 he made his big league debut against the Arizona Diamondbacks. We look back at that day, what got him there, and look ahead to what Pacheco needs to do to remain Living The Dream in the major leagues. Favorite Player Growing Up: Cal Ripken Jr.
Jordan Pacheco has spent five seasons in the Colorado Rockies organization, five seasons which included transitioning from an infielder to a catcher, five seasons of bus rides, weight rooms, and hard work. On September 6th, 2011 all the hard work paid off as he made his major league debut. For one month last September, Pacheco went from Chasing The Dream to Living it as a member of the Colorado Rockies. While more work needs to be done for Pacheco to earn his place as a permanent fixture on the major league roster, a strong final month of the season has put him in the discussion as training camp is now under way. Pacheco played three seasons at the University of New Mexico, each season the second baseman continued to improve all aspects of his game. In his final season at the University of New Mexico Pacheco put up some impressive numbers. He hit .397 and led the Mountain West Conference in doubles (21), walks (43), and runs scored (63). Playing second base for New Mexico he was named All-Conference at his position and was also awarded with the prestigious honor of MWC Player of the Year. The Colorado Rockies were impressed with what they saw out of the athletic Pacheco and drafted him in the 9th round of the 2007 draft. Pacheco saw time in the infield in both his rookie season in the minors and in the majors. After quickly signing with the Rockies he was able to get his first taste of professional baseball playing for both Colorado’s rookie league team in Casper and also their low A-Ball team in Tri-City. Playing all over the infield, Pacheco saw action at second base, shortstop and third base during his rookie campaign. Most of the season was spent with the Casper Rockies (55 games). He hit a solid .292 with Casper, belting 3 home runs and driving in 29 base runners. His performance earned him a late season call up to the Tri-City Dust Devils. Pacheco hit .258 during his 8 game stint with the Dust Devils to close out the year. As the 2008 season approached the Rockies changed there approach to Pacheco. The organization decided to make a change in Pacheco’s development plan. Instead of playing everyday at various positions around the infield the athletic Pacheco would be moved and developed as a catcher. The first part of his season he worked hard at learning the ins and outs of catching and game calling. Once Tri-Cities season got underway in June, Pacheco was assigned back to where he ended his 2007 season to implement what he had learned during his stint in extended spring training. Playing exclusively at catcher all season long he struggled at his new position leading the league in errors and passed balls. However at the plate Pacheco put up strong numbers, hitting .280 for the season, He also led the entire Northwest league only striking out once every 10.7 at bats. In only his 2nd full season as a catcher in 2009, Pacheco’s career seemed to take off. The backstop posted incredible numbers in the South Atlantic League as a member of the Asheville Tourists. He posted a .322 batting average and launched 13 home runs while producing 79 RBI’s. On top of these great numbers he was also named to the South Atlantic Leagues All-Star team and won the leagues MVP trophy at the end of the season. Pacheco’s stock was on the rise around baseball as he was beginning to get noticed as a coming attraction for the Colorado Rockies. To start the 2010 season Pacheco was advanced one level to the Modesto Nuts of the California League. He continued to terrorize pitchers hitting for a high .321 average. He also continued to be hard to strike out, once again leading the league striking out once every 10.83 at bats. Once again he was honored as an All-Star as his offensive stats and his improved defense behind the plate were hard to not notice. Earning a late season promotion to the Tulsa Drillers due to his excellent play and an injury to Wil Rosario, another highly regarded catching prospect, Pacheco didn’t disappoint. In the final 21 games for the Drillers he drilled opposing pitchers. In 78 at bats, the backstop hit .333 with 1 home run and 19 RBI’s. Things continued to look up for Pacheco heading into the 2011 season. Even though he only had a short taste of AA-Baseball to end the 2011 season it would prove to be all he would get at that level. To begin the 2011 season Pacheco would be assigned to Colorado’s AAA team, The Colorado Springs Sky Sox. As a member of the Sky Sox Pacheco played primarily as a catcher but the Rockies did play him in five games at third base. It marked the first time since 2007 that Pacheco had put down his catcher’s mitt for an infielders glove. Regardless of position one thing was apparent Pacheco could hit for a high average and showed continued fantastic plate discipline. Over the course of his minor league career Pacheco has only struck out 196 times in a whopping 1978 plate appearances. As the Sky Sox season came to a close Pacheco got the news that every player dreams of. Sitting in manager Stu Cole’s office Pacheco was told the news. 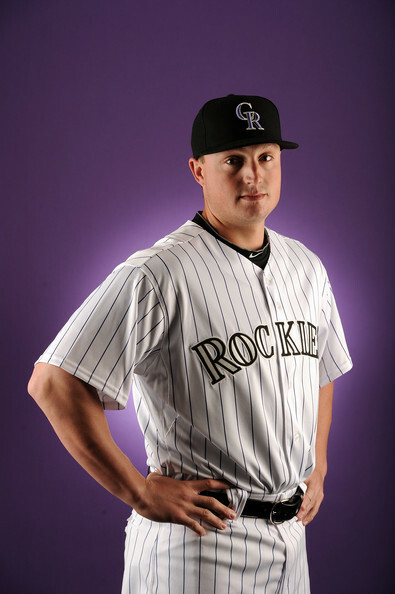 He would be spending the final month of the 2011 season with the Colorado Rockies. The Rockies wasted no time getting Pacheco into game action. On September 6th, 2011 Pacheco made his major league debut. However it was not behind the plate, Pacheco got the start at third base. In his first game action Pacheco was impressive going 2 for 4 for the game. He drove in 2 runs as well and will always be a day to remember. Playing in 21 games with the Rockies to close out the season he was used in a number of roles, getting starts not only at third base but also at first base and catcher. Pacheco’s first major league home run came in a wild affair on September 10th, 2011 off of Reds pitcher Matt Maloney. The Rockies went on to win the game 12-7. In 84 at bats he hit .284 with 2 home runs and 14 RBI’s proving that he could hit at the major league level. 2012 training camp is underway and the big question circling around Pacheco is where does he fit with the current Rockies team. In the off-season the Rockies brought in veteran catcher Ramon Hernandez. He could be matched up with top catching prospect Wil Rosario to start the season. Another position in which Pacheco saw time last season, third base looks to be filled by free agent signee Casey Blake. Another super prospect Nolan Arenado is waiting in the wings there. There is a chance that Pacheco could be used all over the infield and behind the plate this season as a super utility type of player. Pacheco could also find himself in a roster squeeze back in Colorado Springs waiting for another chance at the majors. Only time will tell but with Spring Training games about to begin we will soon get a glimpse as to how the Rockies may use him this year and what positions he might play. We will continue to follow Jordan’s progression and his story throughout 2012. You can follow Jordan on Twitter at @Jstylep and you can follow myself on Twitter at @CTD_Sypien. What was it like to be drafted? Getting drafted was a dream come true . Its something you try not to think about when you are playing but when the opportunity to play at the next level comes. It’s a great feeling. What were you doing when you found out you were selected? I was actually helping out with a camp at the University of New Mexico when my buddy Chris Carlson pulled out his phone and told me i got drafted by the Rockies. With The Rockies you started out playing the infield and transitioned to catcher. How hard was it to move to catcher? It wasn’t easy but I learned a lot about myself and how much pain I could endure. As a catcher there is many different aspects of the game you have to learn. What has been the hardest aspect of catching for you to learn and improve on? It was the physical aspect of catching. Getting my hip flexors loose enough to squat was probably the hardest thing for me to do. Who in the Rockies organization has been the biggest help in your development as a catcher and or your development in general? I can’t say there has been one person but Marv Foley and Jerry Weinstein have been tremendous supports and teachers. On the offensive side of things who has been the toughest pitcher you have ever faced? When you get to a certain level everyone is good, everybody is tough, you just have to pray sometimes the ball hits the bat and no one catches it. On Sept 6th, 2011 you got the news that you wear heading to the major leagues – How was the news broke to you? Who told you and how did you feel knowing your hard work had been rewarded? Stew Cole called myself and Jim Miller into the office after our last game and said we were going to get the opportunity to play with the big club for the last month. It was a dream come true just knowing that I was going to be able to put on the jersey with the big clubs name across it and actually try to help them win some games down the stretch. You made your big league debut against the Arizona Diamondbacks and also recorded your first major league hits in that game. Can you explain as best as possible from a player’s point what its like to make your big league debut? What pitcher did you get your first hit off of? Did you save the ball or any other mementos from your first game? Well its tough to be in the moment and take everything when you play your first game in the show. All you want to do is help the team win and do everything right. I actually got my first hit off my buddy and fall league teammate Josh Collmenter. The team does a good job of getting you the ball and some lineup cards with official MLB certification on them. During your time with the Rockies you played a number of positions even though you had not appeared in the infield often over the last few years. Was that a difficult transition for you since you were just trying to get adjusted to everything at the big league level? All I tried to do was not mess up to much and make the routine plays. I didn’t feel too much pressure because the organization knew I hadn’t played the infield too much in the last 4 years so they just wanted me to do the best that I could. Do you see yourself still focusing on catching in 2012 or do you think your role maybe changing once again? I don’t decide those things . My job is to be ready when they call on me whether its playing in the infield or behind the plate. Favorite Baseball Player Growing Up? Favorite Non-Baseball Athlete? What will your walk up song be for 2012 as of right now? Waiting for my buddy Dane Hamilton to pick that for me. I watch way to much TV. Big fan of Big Bang Theory right now. A special thanks to Jordan Pacheco for taking some time out of his off-season schedule to sit down and talk a little baseball with us. Once again please give him a follow at @Jstylep and follow us at @CTD_Sypien as we follow Jordan and others during the 2012 season.